Spring vacation was a drive down to L.A. There were two things I really wanted to see. No, they weren't the Walk of Fame or the big sign or the stars' homes, but the Jet Propulsion Laboratory and the La Brea tarpits. These were two things which had fascinated me since childhood. But we did get to see the La Brea tarpits. Ever since I was little, I was fascinated by extinct creatures. In sixth grade, we had a Christmas grabbag. Everyone was supposed to bring a wrapped present, and they were all thrown into a big box. We each reached in and picked one. I got a deck of cards, and the teacher said, "That's great! You can play cards with your brother." But I was bummed - we already had cards at home. Some other kid was sitting not far from me, looking totally disappointed because all he got was "this dumb dinosaur book." We traded. The teacher said to me in the most disapproving tone, "Why'd you do that?" I wanted to tell her, Well, because dinosaurs are cool. She totally didn't understand. Dino drawings I did in sixth grade; and illustration of saber-tooth and giant ground sloth at the La Brea tarpits - from The World of Prehistoric Life, ed. L. Plowden et al., 1971, Ottenheimer Publishers, Inc.: A book I had as a kid. I still have that book. Over the years as I've gone to college and moved and salvaged things from my old house before my folks could throw them away - I always saved my old dinosaur books. A favorite was called Dinosaurs and Other Prehistoric Animals. I read and re-read the sections on dinosaurs, but it wasn't until later that I became interested in the "other prehistoric life." I had a bag of multi-colored prehistoric animals, and loved the red T. rex and the blue triceratops, but I never got into those weird, weird mammals and other post-dinosaur creatures: the gray giant flightless bird, the yellow saber tooth tiger, the green mastodon, the red glyptodont - like a sphere-shaped armadillo. Not until later did I grow to appreciate those guys: around the same time that I discovered trilobites and sea scorpions and ammonites and dragonflies with three-foot wingspans. I found that there was a whole lot more to the fossil record than just dinosaurs. What I learned about the pits fascinated me. In most places the bones are just scattered about, broken-up pieces here and there. But the tarpits hold an amazing concentrated density of bones. In less than four cubic yards of asphalt dug from the pit, a paleontologist found 50 dire wolf skulls and 30 saber tooth skulls, plus remains of bison, horses, sloths, coyotes and birds! Not only that, but the fossils are incredibly well preserved - the detail is amazing. Unlike other fossils, the La Brea specimens are also not squashed and distorted by geological pressures. 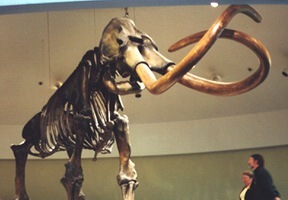 This is a 12-foot-tall skeleton of an adult imperial mammoth, the largest of the elephants that lived in North America. 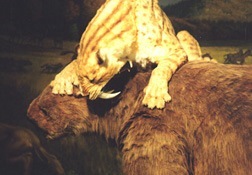 The museum has a very impressive array of mounted skeletons, including a couple saber tooth cats, a ground sloth, the mammoth shown here, and a blizzard of dire wolf skulls. (Dire wolves are like timber wolves but dumber.) You can also see fossil preparers at work and "test your strength" against tar goo. (Goo wins.) The museum is decorated with a wraparound bas-relief sculpture that illustrates these extinct animals, but badly needs cleaning. For more fotos related to the tarpits, click here. 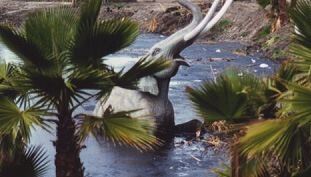 La Brea tarpits and George C. Page Museum of La Brea Discoveries. 5801 Wilshire Boulevard, Los Angeles, Ca. 213-936-2230. Open Tues-Sun, 9:30-5 pm; closed Mon. Students with ID, $3.50; Adults, $6. Their homepage is here. The pits and the museum abutt the Los Angeles County Museum of Art. Across the street is a museum of miniatures and the Peterson Automotive Museum is around the corner. Site visited 3/99 and again, 11/01. Still very cool.